"Bad Bob" & Glen Plake getting some air. Scroll down to see Bob in action. Two Time World Champion Bob Salerno has personally trained on ski simulators since August of 1974. Since September of 1974 he has trained countless others on simulators. 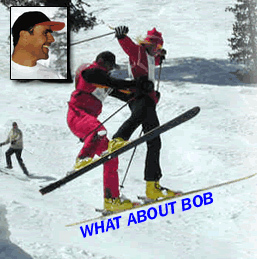 By 1995 Bob had accumulated more experience with ski simulators than most people in the world. This is when he formed a partnership with Jane and Dan Owen who brought a background in education and marketing to the world of ski simulators. From 1995 to June of 2005 Virtual Snow expanded from one location in Southern California to 11 total in the US and Canada. Ten Virtual Snows were added despite the fact that we had not been marketing our products or services. A decade ago Bob, Jane and Dan decided that we did not want to expand quickly. Instead we have been channeling the majority of our efforts into research and development. We wanted our system of training skiers and snowboarders to be the very best introduction to these sports that is possible, and we have arrived! In June of 2005 the Virtual Snow Showcase DVD was released signaling the end of research and development and the beginning of our first promotional phase. Founder and Owner of Virtual Snow Los Angeles, Bob Salerno is a World Ski Champion and Legend in Freestyle Skiing. He has personally coached eight World Champions, and countless experts & beginners. Bob has an array of trainers that are continually trained and certified to give all levels of skiers and boarders quality assured training to make their experience on the mountain fun ones!